The present study was conducted in the Halda river to know the present status of egg collection and to know the livelihood status of the fishermen. This survey was carried out on 200 respondents who are directly involved with the egg collection. Among the respondent, most of them belong to the age of 45 years (9.5%), 50 year (9.5%) and 60 years (8.5%). 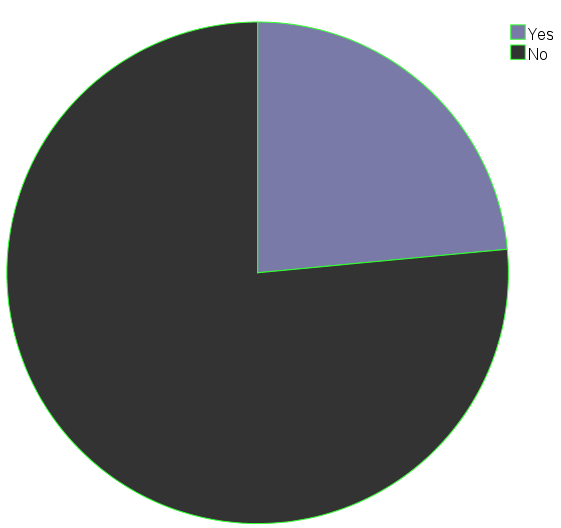 64% of the respondents from Hathazari Upazilla and rest (36%) from Raouzan Upazilla. Among 14 Union, most of the respondents participated from Gorduara (39%), Uttar Madarsha (14.5%), Raouzan Pauroshova (12%) and Gohira (10%). Most of them have 3 boats (23%) and collecting egg for past 10 years (76%). The income from the egg collection is not sufficient as reported by 76.5% respondents. This low amount of income is not enough to maintain their family (78.5%). As a result, fishermen leaving this profession (93.5%). 76.5% reported that the amount of egg is decreasing since the spawning environment is being degraded (60%). There are a lot of factors (41.5%) acting behind this degradation pattern of the environment. Water pollution (29%), sand digging (16%), tobacco culture (0.5%), boat passage (3.5%) and others (9.5%) are notable causes. In the present study, a record-breaking amount of egg was collected in 2018, reported by 39.5% respondents. Most of them collect 160 kg (13%), 192 kg (5.5%) and 256 kg (5.5%) of egg, respectively. 22.5% respondents reported that they produced 3 kg fry, while 13% produced 2kg fry this year. Most of the fishermen used mud scoop (70%) for the huge production (24%) and rest 30% used cemented sistern due to lack of mud scoop for the egg fertilization. The reason behind getting the huge amount of egg this year are assistance from IDF (34.5%), good management (24%), help from the government (15%) and banning brood stock catching (6.5). Successful maintenance of the river and sustainable protection of its unique resources largely depend on the integrated approach of different stakeholders. Halda river has great importance since it is a natural breeding ground of carp fishes. It also a major source of naturally occurring Indian major carps (Bhuyan et al. 2017; Bhuyan and Bakar, 2017; Patra and Azadi 1985). This breeding phenomenon makes this river a unique heritage site of the country (Tsai et al. 1981; Patra and Azadi 1985; Kibria et al. 2009; Kabir et al. 2013). Several species of fish and other freshwater fish species usually breed in the Halda River (Tsai et al. 1981 and Patra and Azadi 1985). Spawning area of this river started from Garduara to Maduna Ghat where a total of about 1100 egg collectors and 2000 fisherman catch fish all the year round (Islam 2009). Fertilized eggs of Rohu (Labeo rohita), Katla (Gibelion catla), and Mrigal (Cirrhinus cirrhosus) are collected from the Halda River (Ali et al. 2010; Tsai et al. 1981). Halda fry is very healthy and is mostly disease resilient, inbreeding free, have high subsistence rate, and able to live in stressed environments (Kabir et al. 2013). Moreover, the Halda river is also important for fresh water supply, transportation and waste assimilation provision, recreation and tourism, irrigation, agriculture, fish farming and livestock rearing, drinking and bathing (Kabir et al. 2013). Despite the importance of the river, it is being polluted day by day (Bhuyan and Bakar, 2017; Hossain et al. 2015). Pollution of the river can be caused by either natural or anthropogenic causes (Camusso et al. 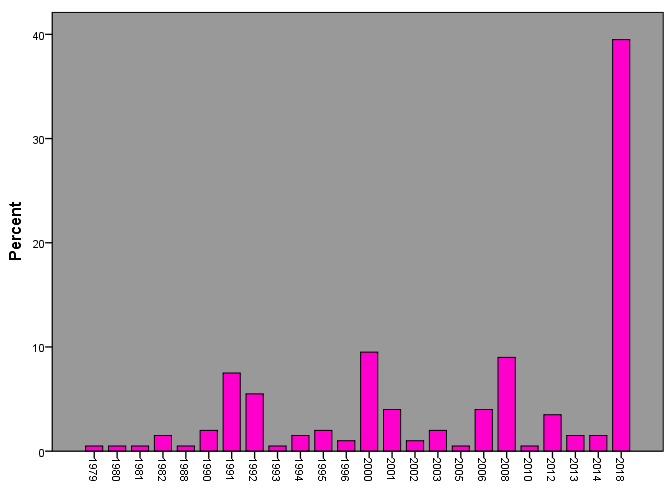 1995; Zhou, 1995; Bhuyan et al. 2016; Islam et al. 2016; Bhuyan and Bakar, 2017; Bhuyan and Islam, 2017; Bhuyan et al. 2017). As a result, the amount of egg and fish is being reduced (Kabir et al. 2013; Khan, 2008; Hossain et al. 1988). Due to the reduction of egg and fish, the dependent group (e.g. Spawn fishing communities) are the most vulnerable in terms of economic conditions (Akhtar et al. 2017). They have to take assistance from the lending institutions, Government banks and NGOs to meet their basic needs (Akhtar et al. 2017). They earn handsome amount of money during egg collection season but they can hardly save for year-round sustenance of their livelihood. Sufferings from financial hardships are common in the life of spawn fishers across the year (Afsar, 2001). Natural calamities such as overdue or insufficient rainfall, variation in water temperature and water current have become noticeable in the natural breeding ground of the Halda River (Akhtar et al. 2017). Furthermore, illegal catching of brood fish, pollution, non-functioning sluice gates, modification of the natural bends of the river are regarded as a serious risk to the broodstock (Akhtar et al. 2017). Hence, the present study was conducted to know the present catching status of egg and the living condition of the fishermen of the Halda river. The present study was carried out in 1. Madunaghat barua para hatchery area, 2. Madarikhal hatchery area, 3. Machuagona area, 4. Garduara area, 5. Angkurigona area under Hathazari Upazilla and 6. West Gohira, 7. Kagotia, 8. 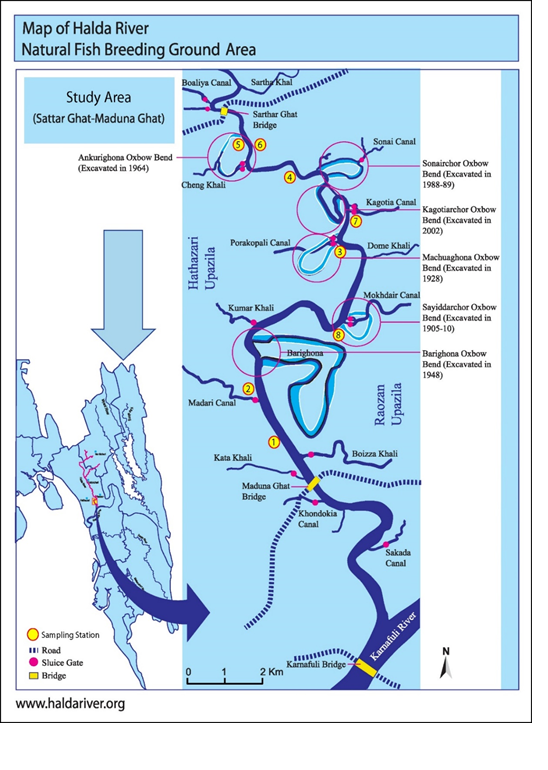 Napiter ghat area under Raozan Upazilla of the Chittagong District, Bangladesh (Figure 1). All egg collectors and fishermen of these areas are engaged in carp’s egg collection from the Halda River and produced fry through their traditional and cemented hatchery techniques. Figure 1. Map showing the sampling sites of the study area. Egg collectors/Fishermen were selected to know the present status of egg collection and their livelihood. A total of 200 fishermen were selected from 2 Upazilla (Hathazari and Raouzan) for the present study. Fishermen were selected randomly from each Upazilla. Data were collected by surveys, focus groups discussion, Participatory Rapid Appraisal, Rapid Rural Appraisal, key informant interviews and direct observations (Bhuyan and Islam, 2016). A structured questionnaire survey was done for this study and candidates were selected arbitrarily (Henry, 1990). The survey design was based on expert advice from local NGO stuff and guidelines for collecting baseline egg collection data (Kronen et al. 2007). Moreover, income and demographic data were collected following regional guidelines (Malleret-King et al. 2006) and validity recommendations (Fink, 2003). A questionnaire was prepared in accordance with the objective set for the study for data collection from fishermen. First of all, a draft questionnaire was developed and then pre-tested in the study area before preparing the final questionnaires. The questionnaire was changed, modified and rearranged according to the experience gathered in the pre-tested survey. The final questionnaire was then developed on logical sequences. Question related to egg collection and livelihood status. The questionnaire was constructed into English and Bengali was used during face to face interview. After preparation of the questionnaire, it was validated with key informants. For questionnaire interviews, simple random sampling methods were followed for 200 fishermen in the two (2) selected area. Fishermen were interviewed at the riverside during fish catching. Interview with each fisherman required about one to two hours. Photography was done for visualizing the interview section. Field surveys were used to observe behavior, relation, activity and environmental degradation of the community. Secondary data were collected from different types of journals (both local and international), books, government officials, NGO and others. FGD was used to get an overview of particular issues such as the present egg collection scenario and socio-economic condition of fishermen etc. FGD sessions were conducted at fishermen’s fishing site under the trees where there was natural gathering. Data collected by questionnaire interviews and FGD necessary to check the information for validation. If there were such an item which had been self-contradictory, then information’s were collected from key informants (e.g. Upazilla Fisheries Officer, AFO, and relevant NGO worker). Descriptive statistics including frequency, percentage means, and cross tabulation were executed to represent the data for egg collector. Multiple response analysis was used for open-ended questions where the answers were more than one. Frequency and percentage of the replies were counted in order to find out the priority of the respondents. Data were analyzed using SPSS (v.22) and MS-Excel. The present study was conducted to know the status of egg collection using traditional knowledge along with the livelihood of fishermen in the Halda River. From the findings of the present study, a huge amount of egg was collected in 2018 compared to past year. The record-breaking quantity of egg was found due to the proper management by a different organization. Fishing income has a great impact on the overall socio-economic condition of the egg collectors (p < 0.05). 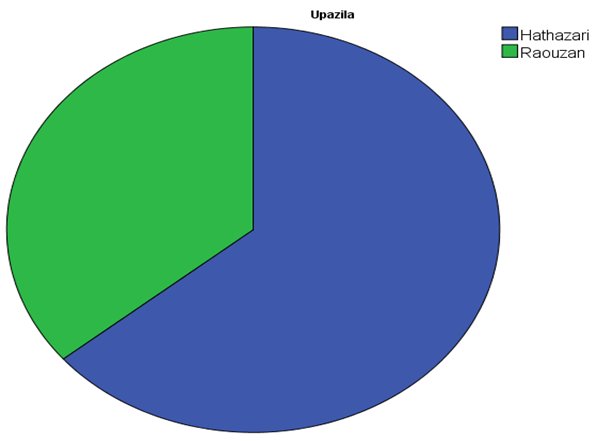 In the present study, most of the data related to their livelihood and egg collection were collected from egg collector of Hathazari Upazilla (64%) and Raouzan Upazilla (36%) (Figure 2). Majority of the interviewees were the permanent resident of Gorduara (39%), Uttar Madarsha (14.5%), RaouzanPauroshova (12%) and Gohira (10%) Union, respectively. Figure 2. Percentage of respondents from Hathazari Upazila and Raozan Upazila. Fishermen were found at the age group of 45 years (9.5%) followed by 50 years (9.5%), 60 years (8.5%), 15 years and 20 years (8.0%), 45 years (7.5%), respectively. Most of them belong to no boat (70.5%) since they have no money to afford. Government ban is not accountable for decreasing pattern of the boat (91.5%) and hence, they reported that capital is the main cause of reduction. 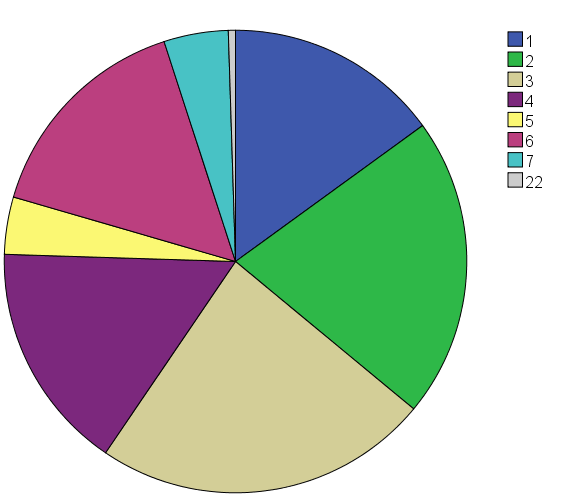 Among the respondents, only 23% egg collector reported that they have 3 boats for egg collection while 21% have 2 boats for their subsistence (Figure 3). But during the past year, most of them belong to 3 boats (31%) and 4 boats (18%). Comparing with past it is clear that the number of boats is reducing due to financial constraint and degradation of the spawning environment of the river. As a result, their livelihood status is worsening day by day. Figure 3. A number of boats possessed by the egg collector. Majority of the egg collector have six (6) member (24%) in their boat while other have four (4) members (18%), in their boat for egg collection. Only 0.5% of the egg collector have fifteen (15) members in their boat. This is another indicator of their livelihood status. From the findings, it can be mentioned that most of the fishermen living below the poverty line. Among the 200 respondent, 10% fishermen collecting egg for 30 years while 9.5% egg collector continuing this profession for 10 years. About (76%) of the fishermen continuing egg collection for the last 10 years following their ancestors though they have to face different obstacles. Most importantly they have no other choice to do. Only 9% have continued this profession for the last 3 years. This is a striking feature of the present findings that they are leaving this profession by the time being. The income from the egg collection is not sufficient as reported by 76.5% respondents whereas only 23.5% mentioned that income is enough (Figure 4). Unfortunately, this low amount of income is not enough to maintain their family (78.5%). They cannot meet their basic needs (e.g. Food, Treatment, Cloth, Education etc.). They have to run their family by taking a loan from the relatives and from different NGOs (Akhtar et al. 2017). As a result, fishermen leaving this profession (93.5%). During the offseason, most of the egg collector involved themselves in agriculture (48.5%) while some of them working as a day laborer (17.5%). 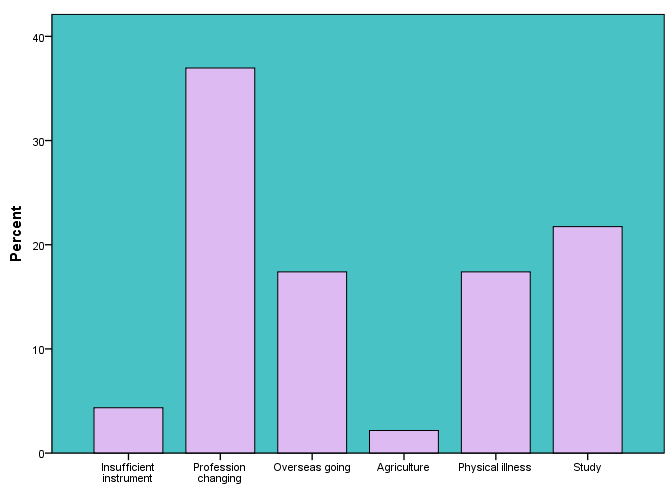 Another 34% of the respondents lead their life by doing different activities. Figure 4. Percentage of respondents’ perception regarding whether their income is enough. All of them expressed that they want to continue this profession in the future. Though they are collecting egg continuously (76%) but somehow they have to stop egg collection (24%) from the river. Egg collection pattern is being altered due to various issues. The most important cause of this reducing pattern is the alteration of spawning environment (76.5%). 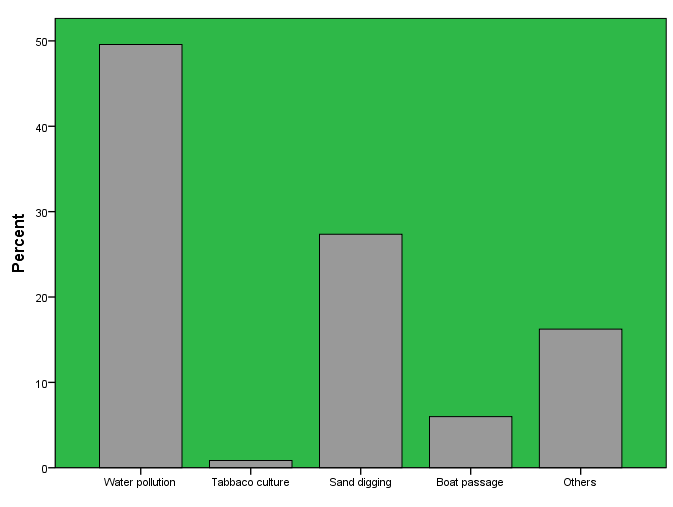 Water pollution (29%) is the main culprit for the destruction of the spawning ground followed by sand digging (16%), tobacco culture (0.5%), boat passage (3.5%) and others (9.5%) are notable causes (Figure 5). Figure 5. Reasons for degradation of the spawning environment. 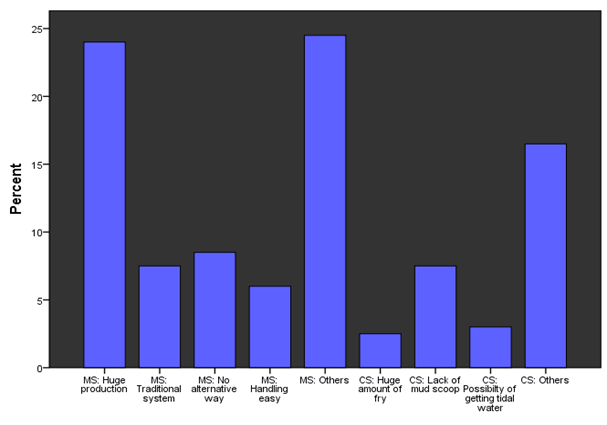 77% of the egg collector mentioned multiple causes (e.g. insufficient instruments, overseas going, agriculture, physical illness, study etc.) for not collecting the egg while 8.5% reported the profession changing is the main cause (Figure 6). Figure 6. Reasons for not collecting egg. Moreover, the amount of egg is being reduced due to the indiscriminate catching of broodstock (13%) from the river. 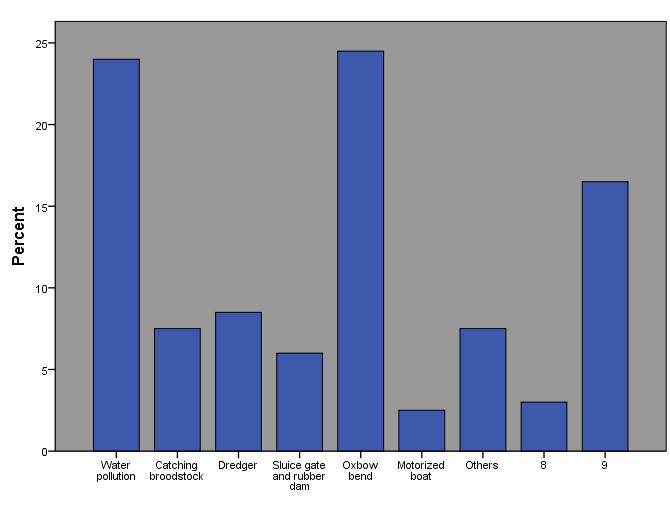 While water pollution is another big issue besides broodstock catching (Figure 7). Oxbow bend, motorized boat, dredger, sluice gate and rubber dam are also responsible for the reduction of the egg. Islam et al. (2017) also reported the same causes for the destruction of spawning ground of the Halda River. Figure 7. Reasons for decreasing pattern of the egg. The most important findings of the present study are that this year (2018) a huge amount of egg was collected from the Halda River. The record-breaking amount of egg was collected in 2018, reported by 39.5% respondents (Figure 8). The amount exceeded the amount recorded in the previous year. Most of the egg collector was found to be satisfied with the amount of egg. They collected 160 kg (13%), 192 kg (5.5%) and 256 kg (5.5%) of egg, respectively in 2018. The amount of fry they found from the collected egg is also up to the expectation. 22.5% of the respondents reported that they produced 3 kg fry, while 13% produced 2kg fry this year. Figure 8. Egg collection pattern from 1979-2018. There are a lot of factors worked behind the getting huge amount of egg. Along with the government, local people and NGOs also worked hard to conserve the healthy environment of this dynamic river. 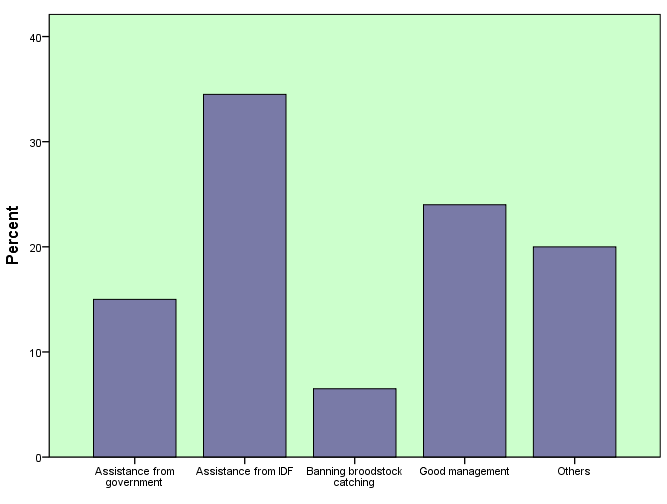 Most of the fishermen reported that the help from IDF (34.5%) is the most important cause for getting a massive amount of egg (Figure 9). Their regular monitoring and other activities help to attain this feature. Moreover, good management (24%), help from the government (15%) and banning brood stock catching (6.5) during the spawning period also act as a powerful tool for getting a huge amount of egg. Figure 9. Reasons for getting a huge amount of egg. They used traditional knowledge in the fertilization of the egg of the carp fish. Indigenous knowledge is a powerful tool in the Halda River for both egg collection and egg fertilization. Mud scoop is the fertilization technique continuing from generation to generation. It is totally a method based on indigenous knowledge. In the present study, most of the fishermen were found with mud scoop (70%) technique since the huge production (24%) whereas rest 30% were recorded to use cemented sistern due to lack of mud scoop for the egg fertilization (Figure 10). To stop the illegal catch of broodstock, different stakeholder (e.g. police, coastguard, army, local folk etc.) should work together and raising awareness among the fishermen will be the effective measurement. Involvement of local community in the safeguarding of broodstock must be increased. Strict enactment of the law is key to protect the carp broodstock that is the main source of the egg. Reducing the illegal influence of local politician in the hatcheries. Cutting of river bends must be banned which is largely liable for erosion and devastation of the breeding grounds. Pollution from the industrial sector, the domestic sector, and the agricultural sector must be controlled. Redesign of existing sluice gate and removal of rubber dam as well as concrete dam from the river to ensure normal flow pattern of water. Government-owned hatcheries should be provided with suitable facilities and a skilled technician to help the spawn fishers in the successful hatching of spawn. The authority of the hatcheries should provide required information to the fishermen during hatching to get strong and healthy fry. The government has (bare) land should be allotted to those who have lost their households and properties by river erosion. It will help to increase the resilience of spawn fishing community. A loan with low interest must be provided to the fishermen both from Govt. and local NGO to increase boat number. An alternative source of income must be created and monthly allowance (e.g. rice, money etc.) should be provided to the fishermen during lean season to secure their livelihood. Finally, an integrated approach is needed to address the threats associated with egg collection activities and all the stakeholders should come forward to safeguard and withstand this exclusive resource of the Halda River. Afsar, R. 2001. Sociological Implications of Female Labour Migration in Bangladesh. In: Rehman Sobhan and Nasreen Khundker (eds.) Globalization and Gender: Changing Patterns of Women's Employment in Bangladesh (Dhaka, Bangladesh: University Press Ltd.), pp. 91-165. Ali, M.A., Rahman, S.A., Roy, U., Haque, M.F, Islam, M.A. 2010. Problems and prospects of fish fry trade in Jessore district, Bangladesh. Mar Res Aquat. 1: 38–45. Akhtar, A., Islam, M.T., Kibria, M.M., Mia, M.M., Islam, M.S., Kamal, A.H.M., Bhuyan, M.S. 2017. Risk and Coping Mechanisms of the Carp Spawn Fishing Community of the Halda River, Bangladesh. Journal of Zoology, 45: 85-96. Bhuyan, M.S., Bakar, M.A., Akhtar, A., Islam, M.S. 2016. Heavy Metals Status in Some Commercially Important Fishes of Meghna River Adjacent to Narsingdi District, Bangladesh: Health Risk Assessment. American Journal of Life Sciences, 4: 60-70. Bhuyan, M.S., Islam, M.S. 2016. Present status of socio-economic conditions of the fishing community of the Meghna River adjacent to Narsingdi District, Bangladesh, Journal of Fisheries & Livestock Production, 4: 1-5. Bhuyan, M.S., Islam, M.S. 2017. A Critical Review of Heavy Metal Pollution and Its Effects in Bangladesh. Science Journal of Energy Engineering, 5: 95-108. Bhuyan, M.S., Bakar, M.A., Akhtar, A., Hossain, M.B., Ali, M.M., Islam, M.S. 2017. Heavy Metal Contamination in Surface Water and Sediment of the Meghna River, Bangladesh. Environmental Nanotechnology, Monitoring & Management, 8: 273-279. Hossain, M.M., Kibria, G., Mallick, D., Lau, T.C., Wu, R., Nugegoda, D. 2015. Pollution monitoring in rivers, estuaries and coastal areas of Bangladesh with artificial mussel (AM) technology-findings, ecological significances, implications and recommendations. 57 p.
Hossain, M.M., Mahmood, N., Bhuyian, A.L. 1988. Some water quality characteristics of the Karnafuli River estuary. J. of the Asiatic soci. Bang. 21: 183-188. Henry, G.T. 1990. Practical Sampling. SAGE Publications, Newbury Park, CA, USA. DOI:10.3390/f3020244. Fink, A. 2003. The Survey Kit, 2nd ed. SAGE Publications, Thousand Oaks, CA, USA. Islam, M.S., Bhuyan, M.S., Monwar, M.M., Akhtar, A. 2016. Some Health Hazard Metals in Commercially Important Coastal Molluscan Species of Bangladesh, Journal of Zoology, 44: 123-131. Islam, M.T. 2009. Livelihood Condition of spawn carp fishing community at the western part of Halda River, Chittagong, Bangladesh. 81 pp. Kabir, M.H., Kibria, M.M., Jashimuddin, M., Hossain, M.M. 2013. Economic valuation of tangible resources from Halda-the carp spawning unique river located at southern part of Bangladesh. Int J Water Res. 1: 30–36. Khan, S., Cao, Q., Zheng, Y.M., Huang, Y.Z., Zhu, Y.G. 2008. Health risks of heavy metals in contaminated soils and food crops irrigated with wastewater in Beijing, China. Environ Pollut. 152: 686–692. .
Kibria, M., Farid, I., Ali, M. 2009. Halda River natural breeding ground restoration project: People's expectation and reality. pp. 57. Kronen, M., Stacey, N., Holland, P., Magron, F., Power, M. 2007. Socioeconomic Fisheries Surveys in Pacific Islands: A Manual for the Collection of a Minimum Dataset. Secretariat of the Pacific Community (SPC), Noumea, New Caledonia, Available at: DigitalLibrary/Doc/FAME/Manuals/Kronen07SocioFishSurveys.pdf. Malleret-King, D., Glass, A., Wanyonyi, I., Bunce, L., Pomeroy, B. 2006. Socioeconomic monitoring guidelines for coastal managers of the Western Indian Ocean. In: Coral Reef Degradation in the Indian Ocean (CORDIO East Africa). Patra, R.W.R., Azadi, M.A. 1985. Limnology of the Halda river. J NOAMI 2: 31-38. Tsai, C.F., Islam, M.N., Karim, R., Rahman, K.U.M.S. 1981. Spawning of major carps in the lower Halda River, Bangladesh. Estuaries 4:127–138. Zhou, Q.X. 1995. Ecology of Combined Pollution. China Environmental Science Press, Beijing, pp. 1–29.